Honda just recently revealed the all-new, redesigned 2017 CR-V, which is slated to hit dealerships this winter. The Japanese automaker touted the updated model’s new features and turbocharged engine, a first for the CR-V. But reading about the 2017 Honda CR-V’s new offering is one thing, while seeing is another entirely. Amid the quick cuts and “swoosh” sound effects, this 30-second clip manages to show off several of the CR-V’s best features. 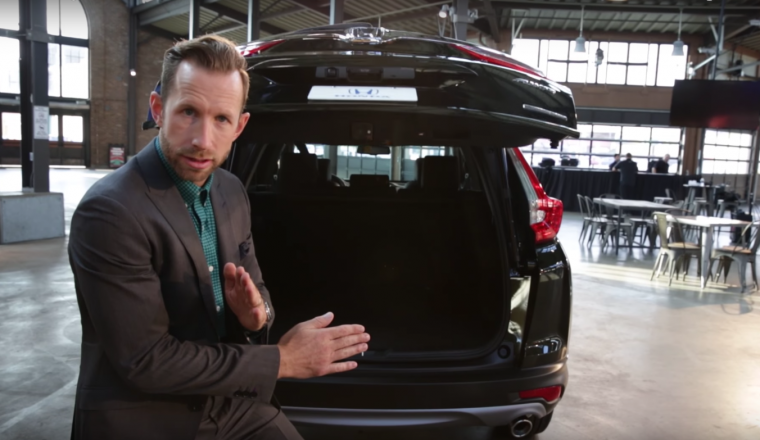 Actor and The List host Bradley Hasemeyer highlights the cool wing LED headlights, as well as available features like the Dual Chrome Exhaust and Hands-Free Access Power Liftgate. Honda Public Relations Manager James Jenkins also shows up to 190-horsepower, 1.5-liter turbo engine that’s making its CR-V debut in this model. (You may recognize James Jenkins from that Honda Accord 40th anniversary video—or maybe not, since he wore an Afro wig in that one). The second video begins with a bad “hey/hay” pun, before turning its attention to the compact SUV’s interior. The new CR-V’s cabin is more spacious than the previous model. It also offers upgraded materials, a new color TFT driver information interface center meter display, a soft-touch instrument panel, and new stitched seats. There is also an available 7-inch touchscreen Display Audio interface with Android operating system, which now includes a physical volume knob and a new Honda Satellite-Linked Navigation System that was developed in partnership with Garmin.